Times are tough for 31 of Michigan's 45 varieties of freshwater mussels. Sporting evocative names like wavy-rayed lampmussel and round pigtoe, these residents of the state's rivers are imperiled by habitat disruption and pollution and are also threatened by climate change. Michigan State University (MSU) scientists' recommendation to figure out the best places to focus conservation efforts: Worry about fish. In this month's journal Hydrobiologia, researchers say that if you care about those wavy-rayed lampmussels and round pigtoes, then you also must care about Michigan's johnny darters and rosyfaced shiners. This research group for the first time creates models that acknowledge how tightly the fate of mussels and fish are entwined in the state's ecosystems and helps chart a path for conservation managers to save the mussels. Mussels filter water – a single one can clean up 20-30 gallons a day – as they eat, and excrete nutrients upon which other water organisms can feast. Their shells are important terrain for algae and insect larvae to attach, and mussels are an important food source for some aquatic critters. 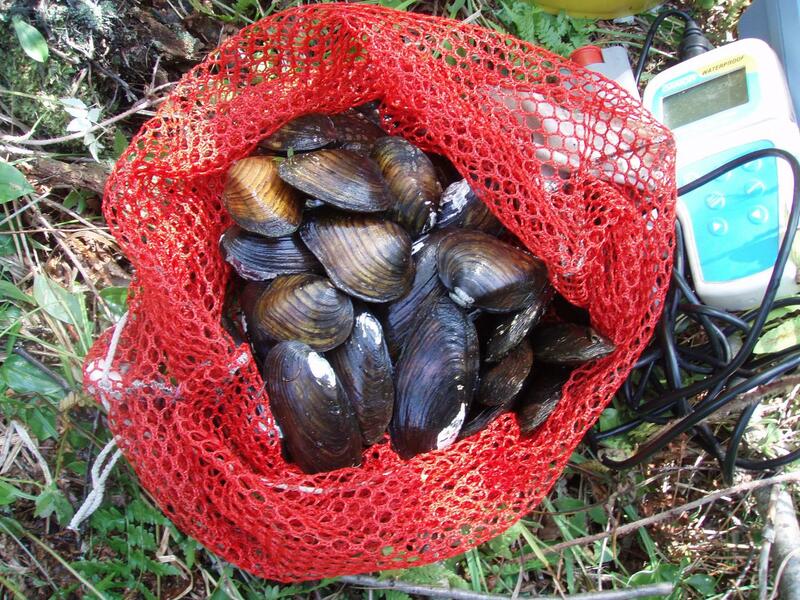 "Mussels need host fishes to spawn, and some mussels are obligated to just a few species or even a single species for their hosts," said Dana Infante, associate professor of fisheries and wildlife in MSU's Aquatic Landscape Ecology Lab. "The big message for conservation is that to protect imperiled mussels, we must also protect their host fishes." Mussels start life as larvae that must, after being expelled by their mothers, hitch a ride on fish gills. They usually don't harm the fish and simply fall off when they develop into juvenile mussels. But it's not any fish – different varieties of mussels are particular about what species of fish they hang with. So this group selected 11 of Michigan's imperiled mussels and created models that not only looked at prime habitat now and in the future for them, but also for their corresponding fish hosts. "Due to the complexity of threats we have identified in this study, conservation efforts in Michigan should prioritize both protecting the highly suitable mussel habitats that are left, and identifying any additional populations in under-sampled areas of the state," said Wesley Daniel, a former research associate in Infante's Aquatic Landscape Ecology Lab, and now Cherokee Nation Technologies contractor for U.S. Geological Survey in Gainesville, FL. The group notes that streams that have the optimal combination of several imperiled mussel species, low chance of a significant temperature swing with projected climate change and being in a protected area are few, but are a good bet to start conservation efforts. In addition to Infante and Daniel, "Predicting habitat suitability for eleven imperiled fluvial freshwater mussels" was written by Arthur Cooper of MSU and Peter Badra of the Michigan Natural Features Inventory. Infante also is a member of MSU's Center for Systems Integration and Sustainability. She also is supported by Michigan AgBioResearch and the Partnership for Ecosystem Research and Management program.